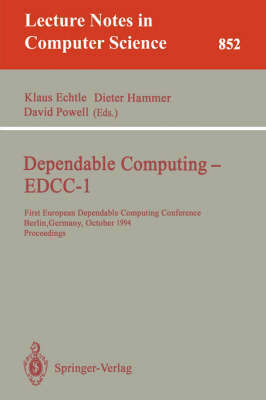 This book presents the proceedings of the First European Dependable Computing Conference (EDCC-1), held in Berlin, Germany, in October 1994. EDCC is the merger of two former European events on dependable computing. The volume comprises 34 refereed full papers selected from 106 submissions. The contributions address all current aspects of dependable computing and reflect the state of the art in dependable systems research and advanced applications; among the topics covered are hardware and software reliability, safety-critical and secure systems, fault-tolerance and detection, verification and validation, formal methods, hardware and software testing, and parallel and distributed systems.